Never Enough Nails: Pink Wednesday- Nails Inc. Topping Lane!! I haven't done a good Pink Wednesday in awhile!! Today I have a really cool pink polish to show you, Nails Inc. Topping Lane. Topping Lane is the first Nails Inc. polish I have tried and I need more!!! This is from Nails Inc.'s Special Effects Sprinkles collection and I now want the rest of the polishes in that collection. Topping Lane is described as a "pink with cerise, silver and purple sprinkles". The glitters in this polish really do look like sprinkles. This is three coats of Topping Lane. It was pretty good in two coats, but I did a third for the camera. There is a little VNL, but the pink base is kinda squishy, so it looks pretty instead of annoying. This was seriously easy to apply. It flowed on to my nails like butter. No problems with the glitter placement, no special methods of applying. Just fantastic!! I bought this one to try the Sprinkles collection out and I definitely think I will order at least Sweet Away and Pudding Lane, if not all three of the remaining polishes. Nails Inc. 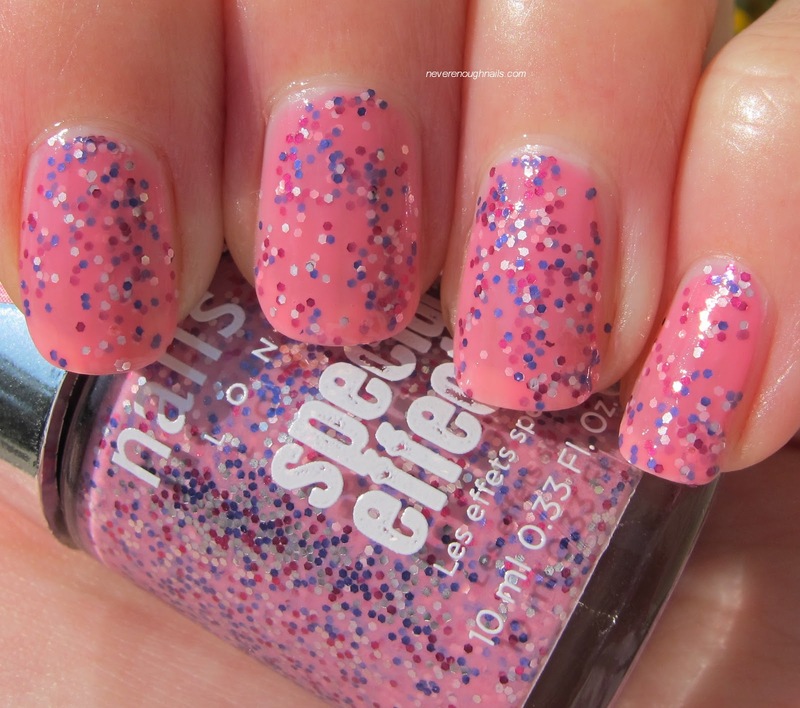 Topping Lane and the other Sprinkles polishes are available online at Sephora.com. I love the Sprinkles collection - the more pictures I see of them just makes me want to get them even more! Topping Lane is so pretty! You won't believe how nicely this applies too, Jem's Polish! I will definitely pick up the others soon! It was definitely a winner to try for my first Nails Inc.! Do you have any of the Sorinkles polishes TikiBarbie? Topping Lane was my gateway polish too.... after I tried it, I ordered the others in the collection! Uh oh Sasha! I can feel myself caving LOL!